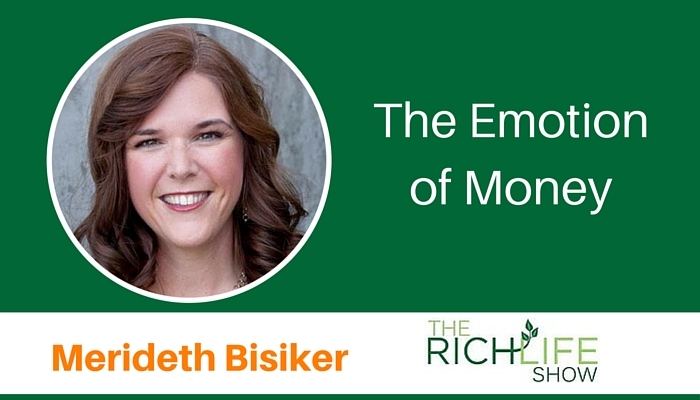 Certified money coach Merideth Bisiker talks money, behavior and the emotions behind them. 00:00 Beau Henderson: We are gonna talk with a guest, who’s a certified money coach, and she helps men and women take courageous action so they can have a healthy relationship with money. Now that’s my kind of language. Merideth Bisiker, welcome to the RichLife Show. 00:16 Merideth Bisiker: Thank you for having me Beau. 00:18 Beau Henderson: Well let’s talk about this, so I love this you help men and women take courageous action with money. So usually there’s a story when you do something… Well, let me back up. What is a money coach? 00:29 Merideth Bisiker: Ah, good question. So I’m certified through the money coaching institute in Nevada and California, and there’s all sorts of money coaches out there. My job, through my certification is to help people uncover their unconscious beliefs around money, so that they can understand why they have certain behaviors around money and continue to make what they might think is mistakes around money and follow certain patterns, so I like to dig deep. 01:00 Beau Henderson: That’s so important, because one of the things that’s come up for me over the years in the financial planning world, is that money is pretty simple to understand, it’s pretty much math, and you can figure that out on spreadsheets and… But it’s not that… The problem is money doesn’t work like it does on a spreadsheet, because we’re dealing with people, and we’re dealing with life, and that has to do with emotions and fear and all these other things, and usually the money problems I see with people, in a financial planning context, it’s really just a symptom of something else going on like you’re talking about. 01:35 Merideth Bisiker: Exactly, exactly. 01:37 Beau Henderson: So what’s the… When you’re out there… So let’s talk about, why did you get into this work? There’s usually a story behind a business or a mission when I talk to somebody on this show, so is there a story of what made you or drove you in the direction of wanting to passionately help people with these money issues? 01:55 Merideth Bisiker: You bet, you’re right on the money, no pun intended with that one. 02:00 Merideth Bisiker: That was not on purpose. [chuckle] So I’ve been working in banking and finance for about 20 years, a little bit more than that, and like you said, money’s pretty easy to understand when you’re looking at it on spreadsheets, and working in banking I had the opportunity to be on the other side of the counter when someone was coming in if they were upset, perhaps about bouncing a check or where’s their next dime gonna come from. That was fantastic, until that happened to me and my husband. About five years ago my husband was laid off from his job, and we decided we’d just go full-bore and start our own business, and that didn’t go so well. It probably would have been okay if I was able to work full-time, but our second baby was born and I needed to be at home with her. We really did have a financial crisis. We managed to pull out of it, but a year after, when money was rolling in and we were getting some money into savings and paying off debt, I was still extremely anxious about money, and I could not figure out what was going on, and then it hit me. I can tell you Beau, where I was, I bent over to pick a sock up off my floor and it literally hit me, “There’s something emotional going on here.” And that set me off on this search to figure out exactly what was happening. And I was reading a fantastic book. Do you know the book by Karen McCall called ‘Financial Recovery’? 03:37 Beau Henderson: I have not read it. I’ll put it on my notes though. 04:02 Beau Henderson: And I think that’s another great point to bring up for people, is that not everything… When you deal with money it’s not all necessarily young kids or couples starting out that are struggling initially. A lot of times, people will be plugging along in life okay or pretty well and life will happen, and they find themselves in a situation. 04:21 Merideth Bisiker: Exactly, exactly. And no matter… We started our business in good faith, we took that risk. I’m quite proud that we took that risk, we learned a lot. But yeah, there are people out there… I say I help people who make relatively a little bit of money or they could be making six figures, they’ve just got themselves in that situation. 04:42 Beau Henderson: Yeah, another great point is that there’s, you can be making a lot of money and still be broke and going backwards. There’s some things you gotta work out. So, I tell a story, that’s a true story, a couple of years ago within the course of a week, I had two 52-year-old men come into the office, and by demographic they looked… I mean, a 52-year-old male. I think it’s just nice the way they… It happened to happen in a week for me to have this story. First guy was a surgeon, and a surgeon made over $500,000 a year at a local hospital, and came up in his Maserati, had the the big lake house out… Second lake house and all these things and by… What you would think, you would think this guy had, he had just made it. This is the American Dream. 05:32 Beau Henderson: And then I had an electrician, a one-man solo electrician pulled up, guy was actually missing teeth, talked so country, and you’re gonna laugh about this, talked so country I could hardly understand him. 05:44 Beau Henderson: But we got into what the numbers actually were, and that surgeon making $500,000 was spending north of $550,000 a year maintaining that lifestyle and that appearance, and that electrician never made more that $60,000 in a given year, but he and his wife lived off about 35, and he had done that for 25 years. And we got down and looked at it, my electrician that you would never think twice about anything, him making it or being financially successful, he had two and half million dollars in his bank. 06:21 Beau Henderson: So that just… I tell people, a lot of times… And guess who was freer, guess who was happier and guess who had more options and more flexibility? 06:30 Merideth Bisiker: Exactly. That’s just it. And I have seen that in the banking and accounting world as well. The people who are striving to keep up with the Joneses, they’re the ones who get into trouble. Heck, I did that in my 20s as well, newly married, with a new condo.” Yeah. 06:48 Beau Henderson: Well what’s the top thing you see out there, people struggling with that are coming to you? 06:54 Merideth Bisiker: Well the people who come to me are struggling with that paycheck-to-paycheck life. They are just lost. And they feel like they’ve tried everything to manage their money and to feel better about their money, whether it’s sitting down and working on a budget every year, maybe every six months, or doing mindset work; visualization, manifestation, but they keep ending back in that same place, really frustrated and they can’t get ahead, and as a result their health is affected, their relationships are affected, and they’re not living a fulfilled life, or a RichLife. 07:37 Beau Henderson: Right. Well, that’s kinda… To me this is pulling together a one-two punch, because I’m a big advocate for financial literacy. We’re four generations in with kids having less savings and more debt than their parents, and one of the things I’m a big proponent of is actually going in to middle on high schools and giving this kids, just some basics, because their parents never got ’em, and it’s just getting worse. And so that’s what I’m seeing so powerful, if people have that one-two punch of, just some basic financial literacy. 08:09 Merideth Bisiker: That’s right. 08:09 Beau Henderson: Income/outcome, assets/liabilities, and then they actually get around their money… They get their head around their money beliefs and can make some… Maybe even some healthy habits around that, then it’s a whole different ball game with dealing with this thing we call, and we give such a big power to, and it’s money. 08:25 Merideth Bisiker: Yes, yes. I love your mission, I think that it’s so important, and I hear that from parents. I have school-aged children and I’ll other parents, [08:35] ____, “You need to do a talk at the school,” or “How do I talk to my kids about money?” Because we don’t know. [chuckle] Our generation doesn’t know how to talk to our kids about money. And if we are sending kids into the world, even into college, sending them away without even understanding the ins and outs of money, no wonder they get overwhelmed, and they only go by what they see, and what we are seeing right now is not healthy. 09:17 Merideth Bisiker: That’s right. That’s right, exactly. And I think about my own situation, where I grew up in a middle-class family, from both sides, mom and dad, and I saw that they were successful with their money, but we never actually talked about it. No one… And I’m not coming at this as a victim, but no one sat down, because they just assumed that I was smart enough to figure it out. Heck, I worked at a bank from the time I was 18. So we can’t assume that in our children. We need to be able to sit down and teach them a little bit about what we know and understand. 09:57 Beau Henderson: That brings up something that I like to do with everybody I’ve ever worked with, is really advocate for healthy families, they just talk about money, and if I can get them on the habit, and this is gonna kinda sound like a… This isn’t gonna sound like a real statistic, but if I can help them sit down once a month and just update those basic financial statements and talk about where they actually are, good or bad, then they are… From research we’ve done, they are the top 10% of families as far as financial literacy because they actually know where they are, they know their numbers. 10:37 Merideth Bisiker: Yes, yeah. I think that’s fantastic. And the language that we use as well. I have really come a way… I’ve gotten away from saying, “We can’t afford that anymore.” I don’t want my kids growing up hearing that all the time, because the truth is, sometimes it’s not that we can’t afford it, most of the time it’s not, when it comes to the basics. We just don’t need to spend our money on that particular item right now, and we can have a good healthy conversation around that. 11:07 Beau Henderson: Yeah, and the conversations too, that brings up another good point is, when the kids are a little older, and you can even do really young as long as it’s age-appropriate, involve them in that family conversation about money, look for learning opportunities, because what happens that I see in a sense like, you throw in talking about the beliefs and emotions and it’s gonna do the same thing, is you take away some of money’s power that we give it that it really doesn’t have. 11:32 Merideth Bisiker: That’s right. Yeah, that’s a fantastic point. As open as possible. 11:38 Beau Henderson: So that again, you’re getting into this area of working on money behaviors, so how does that help somebody when they really sit down and work with you and dig into it? 13:23 Merideth Bisiker: That’s right, that’s right. And it does just take a moment of… Not even a moment, it can take several weeks, couple of months to really get comfortable with changing that behavior, but with some support, with being able to reach out to me and saying, “Oh, I’m having a horrible day today, all I wanna do is go out and eat… [chuckle] “And buy my lunch, and I feel deprived.” At least some sounding that out and being able to reach out will support them more through this, and they’re not going to feel so deprived. 14:14 Beau Henderson: But somebody… Yeah, “I have a friend… ” No. 14:19 Beau Henderson: Somebody that, maybe had an ‘aha’ with this behavior, or making some of these shifts and it just totally gave them a different bigger better result? 14:29 Merideth Bisiker: Yes, I do. I was coaching a woman last year who was, and is still, making six figures, a great income, and she came to me and said, “I don’t have any savings, nothing, and the fact is, when I want something I buy it.” So she didn’t have any debt, but when she wanted something, like a $3,000 stereo, she brought it. Or if she wanted a new car, she went and paid cash for it, and she was starting to get really anxious, because she was nearing 40 and she didn’t have any savings in the bank, and she kept hearing her mother’s voice in the background, “You need to save, you need to save, you need to save.” And we finally hit… I mentioned a financial flash-point earlier on, we found hers, and that was, that when she was young she had siblings who were both… She is very artistic, and her siblings were not, her siblings were sporty, so her parents really supported that, but every time, this woman, as a young girl wanted to do something artistic, her mother wouldn’t pay for it. And so when she was… Fast-forward to when she’s an adult, she’s having these urges to shop when she’s at home by herself, to fulfill something, and we figured out it was this artistic urge that she had really quashed. 16:50 Beau Henderson: Now did that help her start saving, that she had that outlet? 16:54 Merideth Bisiker: Yes, absolutely. For sure, because it stopped her from wanting to spend her money. It helped her just sit back, relax a little bit more, and just be okay with putting money aside and not buy herself anything, right now. 17:11 Beau Henderson: So this is fascinating Merideth, so there’s really an art to helping people overcome some of these emotional behavior challenges, and to me it seems like behavior’s so closely linked with habits. So where does that come in? 17:27 Merideth Bisiker: Well sometimes… It’s tough, because I say to people, “You’ve just gotta do sometimes. You just have to do it.” And people will find all sorts of reasons, “Well, I didn’t sit down and look at my budget this week because I had these other things to do,” but I know, I know in the background, that they’re avoiding it. So sometimes I just have to say, “You’ve got these behaviors happening, you want to stop these behaviors, let’s sit down and work on this budget together, because there’s something you’re resisting.” And that’s what they’ve got me for, they’ve got me to push them a little bit in a gentle way, to start changing these behaviors now and make new habits. Because out of that budget, or what I like to call ‘spending plan’, new habits will arise, and they’ll get more comfortable with the new behaviors that they’re developing. 18:26 Beau Henderson: So it sounds like you actually, you have a… I could be listening, or somebody out there said, “You know what? She’s right, there’s some emotional things here.” But it sounds like you’ve got a process that helps people to actually identify these things. And then like you say, “Okay, there’s a habit that I don’t like what it’s doing in my life, now let’s find another one that’s gonna serve me,” and you actually have a process to take people through that. 18:50 Merideth Bisiker: I do. 18:51 Beau Henderson: That’s what would be daunting to me is knowing I need to work on this thing and not knowing where to start. 18:55 Merideth Bisiker: Exactly. That’s right. It is literally a step-by-step process that we go through. It takes about a month, or I can do something intensively in a day as well, depending on what my client wants, but it is a very defined process that I learned through my training, and it’s not cookie-cutter, because not everyone’s going to respond the same way to the same things, but it is a process that I understand will help everybody out there who needs help with money. It’s been proven. I was trained by Deborah Price, she is the founder of the Money Coaching Institute, and she’s been at this for years. So I’ve been very lucky to have learned [chuckle] from her experience. I haven’t had to do a lot of the research that she’s done to figure this out. 19:50 Beau Henderson: Well somebody’s wanting to figure this out for themselves, how could they follow… I know that they can find you at meridethbisiker.com, and we’ll put this on the show page, but any other ways to interact with you or maybe take a first step to learn a little more? 20:08 Merideth Bisiker: Yeah, sure. They can… I have a great worksheet, that I simply call ‘Make Ends Meet’, and it’s a checklist that takes people through the process of getting a money plan together, step by step, simple. Because like you said, money is simple but it’s that behavioral stuff that’s going on there. So they can find that at meridethbisiker.com/makeendsmeet, and I’m thinking you’ll probably put that on the show notes as well. 20:42 Merideth Bisiker: And of course they can find me on Facebook. I ask everybody to reach out to me if they have questions about money. They just want to say, “Oh, this is what’s going on, how do I start overcoming it?” I’m totally open to that. 20:58 Beau Henderson: So, very good. So, I know you brought up the Karen McCall book, is there any other money book that you would recommend for people? 21:29 Merideth Bisiker: But when we refer to money types, we’re talking about how we’re referring to money right now, and this is a fantastic tool to understand how our mind is working, why we have certain inner-dialogue happening, and it helps us talk back… [chuckle] To that inner dialogue and say, “Is this true? What’s happening? Oh, my victim’s showing up today. Why is that?” I love that book, or that tool. 21:56 Beau Henderson: And you know what? That’s another thing I found, that if I’m clear on kind of my money style or type or behavioral style, that’s very valuable, but if I’m dealing with a spouse, or even a business partner or anything, if I start to understand theirs, that’s even bonus and that’s gonna take me to another level of success, both with just interacting and being as productive with those people as possible, but just for my own sanity too in a way, because if I don’t understand somebody else’s style that I’m working very closely with or doing life very closely with, I’m gonna assume… We tend to be egocentric, right? And I’m gonna assume they’re just like me. 22:42 Merideth Bisiker: Mm-hmm. That’s an excellent point Beau. And Deborah Price has another book called ‘The Heart of Money’, and that is where she brings up the money types that… [chuckle] How we interact with our spouses, and when we understand our spouse’s money type, we can be so much more empathetic, and our language is different, we can say, “I’m feeling… ” You can’t literally say, “My victim’s showing up or my martyr’s showing up or… ” This is simply saying, “I am feeling threatened because… ” And then we can have these mature, effective conversations about money, instead of just having a spat and walking away from each other. 23:21 Beau Henderson: Very good. We’ll check out those books, and I’ll actually have a link to those too so people can check those out. 23:26 Merideth Bisiker: Great, thank you. 23:27 Beau Henderson: How about… So as we kinda come full-circle here Merideth, what is this most important thing as a takeaway you could give us that you wanna make sure comes across for people out there that are struggling with money? 23:44 Merideth Bisiker: Yeah. Yeah, as you said, we’ve come full-circle here. People out there do not need to struggle with their money. They do not need to feel ashamed about their money situation, whether they’re overspending, they’re not making enough, they’re on the verge of bankruptcy. They don’t need to feel this shame and there are people out there, and resources out there to help them overcome this, and just live a RicherLife, to take your tag line. 24:14 Merideth Bisiker: There you go, I love it, I love it. 24:16 Beau Henderson: Brand integration. 24:19 Beau Henderson: Meridethbisiker.com, if you forward-slash ‘makeends… Or slash ‘makendsmeet’, you can get that… The initial worksheet that Merideth had. Find her on Facebook. So Merideth, in kind of a rapid-fire style, what is the best advice you’ve ever received about money and from whom? 24:37 Merideth Bisiker: Oh, gosh! That’s a good question. I’ve received so much advice. You know what comes to me right now, and this might be more attributed to entrepreneurs, but I worked with a great accountant a few years back, and he said at a certain point, you just can’t reduce your expenses anymore, and so you have to find other ways to make money if you want to make ends meet, and that is where my Make Ends Meet worksheet comes from. It’s pretty simple advice and might seem a bit obvious, but sometimes we just can’t pare it down anymore, and we have to find other ways, and let ourselves dream to find other ways to make money and help ourselves become financially stable. 25:32 Beau Henderson: Great advice. Now there’s no limitations, no constraints on this, what would be your definition of a RichLife? 25:44 Merideth Bisiker: Oh gosh, that’s an easy one for me. To be able to, just get out with my family when I want to. So I live on Vancouver Island and to be able to get out every weekend with my family out in nature, out in the forest all year round, and just take that in, that is the best part of my life. Simple. Simple, simple. 26:08 Beau Henderson: And you know sometimes we spend all our life fighting to do a lot of things or accomplish a lot of things and when we get down to what’s really going to make us fulfilled and happy, it is pretty simple. 26:19 Merideth Bisiker: It is. Absolutely, yeah. And I love for people to know that it’s okay to live that simple life. 26:26 Beau Henderson: There yeah go. Well Merideth, thanks so much for coming to the RichLife Show. Love what you’re doing. Would love to have you in the future come and share some more of those success stories, because I think when you do something like that, people resonate or they can identify with that and it gives them some encouragement and inspiration, so thanks so much for sharing today. 26:45 Merideth Bisiker: Oh you’re welcome, thank you. 26:47 Beau Henderson: So, guys go to meridethbisiker.com, check it out, and lets get our… Realize that money is more than facts and figures on a spreadsheet. And as Merideth brought up, there’s not a cookie-cutter approach to figuring this out, because guess what? People aren’t cookies. Right? So, check this out and we’ll be back with a lot more tools, resources and experts to help you live that definition of a ‘healthy, wealthy, fulfilled life on purpose’. Same time next week, right here, on the RichLife Show. Merideth Bisiker, B.A., is a Certified Money Coach (CMC)¨ who helps men and women take courageous action with their finances so that they can build healthy relationships with money and come to terms with their financial past. She encourages her students to dream bigger and create the lives THEY really want. After experiencing a debilitating financial crisis three years ago, Merideth turned what could have led to disaster into a great opportunity: she took the lessons she learned about money and financial shame and turned them into tools and lessons to coach others through their money anxiety and achieve financial peace. Merideth helps her determined students implement realistic plans that work for their own lives, and she supports them as they pay down their debt, grow their savings, and improve their income. As a Certified Money Coach (CMC) with over 20 years of banking, accounting and banking experience, she applies her unique brand of money savvy and positive energy to uplift and support her students.